An identical trio that were prizes from the Pizza Planet crane game. They tend to stick together. "Fear not. We still have our new home. The Chamber of Andy!" The Little Green Men, also known as Aliens (エイリアン, Eirian? ), are three alien squeeze toys from Toy Box who appears in Kingdom Hearts III. They originated in the Disney/Pixar film Toy Story. The Little Green Men welcome Sora not long after he, Donald, and Goofy have arrived in Andy's room, referring to as the "strangers from the outside". After finding Rex in the Action Figures section of Galaxy Toys, and Hamm and one of the toy soldiers in the Babies and Toddlers section, a possessed flying saucer toy is seen flying past. Woody and Buzz immediately realize that the Little Green Men are in danger, and they, along with Sora, Donald, and Goofy, give chase. They pursue it to the Babies and Toddlers: Outdoor section, where they see the Little Green Men being picked up by a retractable hook on the flying saucer. Sora and his friends defeat it, removing the darkness that possessed it. The Little Green Men, now safe, say that "Nirvana will not be reached," but also say that they have their new home, Andy's room. They have lime green skin, three eyes, and three fingers on each hand. They have wide heads, elf-like ears and an antenna-like appendage on their head. They wear blue spacesuits. "You have saved our lives. We are eternally grateful." —The Little Green Men to Mr. Potato Head after he saved them in Toy Story 2. 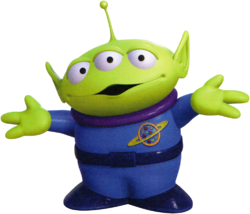 The Little Green Men first appeared in 1995, in Pixar's first feature film Toy Story as prizes from a claw game, one of whom was won by Sid Phillips and given to his dog Spud as a chew toy. The three who appear in the game debuted in Toy Story 2, where they were first hanging from a mirror in a Pizza Planet trucked hijacked by Buzz Lightyear to chase after Al, who was taking Woody to Japan. After Mr. Potato Head saved them from falling out of a window, they joined the rest of Andy's toys, and were adopted by Mrs. Potato Head. This page was last edited on 9 March 2019, at 13:48.